THREE MONTHS AFTER THE PLEDGE TO REGISTER FEMALE PLAYERS, GILKOCK HAS NOW GOT FOUR. Four female players namely Aja Jammeh, Fatou Drammeh,Isatou Hydara and Bintou Camara all 11 years of age on Saturday August 4th registered with the Brufut Academy. These players who are ambitious of being professionals in the near future march to Gilkock's training grounds themselves and declare their interest in becoming footballers. 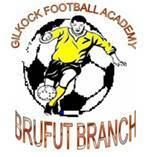 Addressing the female players before the training, the Technical Director of the academy Mr. Buba K Jallow said “it was my intention to register and have players of both sexes for Gilkock Football Academy Brufut Branch and today i am happy that you people are here by yourselves”. He advised the female players to avoid anything that will ruin their football career in the future and concentrate fully on the game. On his part Sang Mendy, Secretary and PRO of the academy advised them to imitate their male counterparts in the academy and avoid shying away from joining their peers to train. On behalf of the female players Aja Jammeh a versatile player said 'I've always wanted to become a professional player and today I think I am heading in the right direction. If becoming a professional is to listen to our coaches we are prepared to do more than that as well.